The Friends of Lincoln Park Steps is a collaborative of neighbors whose goal is to repair and beautify the neglected staircase at the eastern edge of Lincoln Park. The Lincoln Park Steps at California Street and 32nd Avenue, date from the early 1900's and are an elegant reminder of San Francisco’s earlier days. 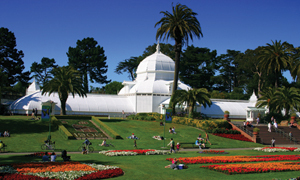 They are a gateway from the surrounding urban neighborhood to the open space of Lincoln Park Golf Course, Lincoln Park Playground, Legion of Honor and Land’s End Trail. They provide a beautiful view from which to admire the Golden Gate Bridge, San Francisco’s downtown skyline and East Bay hills. Decades of neglect have resulted in cracked steps, damaged concrete and a wasted landscape that attract nighttime loitering, frequent graffiti and dumping of unwanted items. Thanks to a Community Challenge Grant from the City and County of San Francisco and the generous support of individual donations, The Friends of Lincoln Park steps completed repairs and tiling of the bench and retaining wall at the top of the steps. In 2011, the Friends were awarded a Community Opportunity Fund from the Recreation and Park Department, who will be repairing the stairs at the end of 2012. The Friends continue to fundraise for the tile portion of the project. Once complete the steps will be a stunning asset for the community, the City of San Francisco and visitors alike. To donate or learn more please visit http://www.lincolnparksteps.org/index.html. Donations of $250 and above will be acknowledged with a named tile. Visit the Friends of Lincoln Park Steps website. Donate to Friends of Lincoln Park Steps.